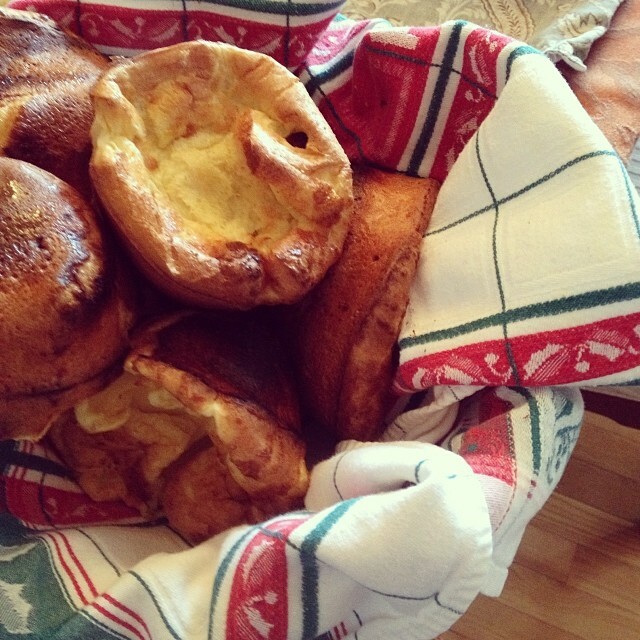 I posted this photo of the popovers I made at Christmastime and friend Tina inquired about it. A popover is a delicate, hollow roll made out of an egg-milk-flour-butter batter. I've blogged about popovers before - we first enjoyed them with tea and jam last summer while visiting Jordan Pond in Bar Harbor, Maine. These are the same popovers, except they were served as a savory compliment to our Christmas meal of prime rib. In the savory preparation, they are also called English Yorkshire Pudding [which really doesn't make sense, since when I think of a "pudding", I think of something sweet - oh the weird world we live in!]. Combine the eggs and half and half in a bowl. If preparing the savory version, pour a small amount of the meat drippings into each cup of a standard muffin pan - just to coat the bottom of the muffin cup. If preparing the sweet version, pour a small amount of melted butter into each cup of a standard muffin pan - just to coat the bottom of the muffin cup. Fill the muffin cup with the egg batter, 1/2 to 2/3 full. Bake at 450 degF oven for 12-14 minutes. They will POP up in the muffin tins. Serve with roasted meat (savory) or with melted chocolate and jam (sweet). Popovers are best enjoyed hot out of the oven, so prepare them last! Enjoy! I have not had a popover in ages! May just have to treat myself. Thank you for sharing this here, Shirley.